Buena Vista Home Entertainment will release the psychological thriller Flightplan on March the 20th. The film, about a mother whose child disappears on a plane flying from Berlin to the US, stars Jodie Foster (returning to movies after a three year hiatus), Sean Bean and Peter Sarsgaard. The disc has a number of bonus features: In Flight Movie: The Making of Flightplan; Security Checkpoint: Story of a Thriller; Captain's Greeting: Meeting the Director - Robert Schwentke; Passenger Manifest: Casting The Film; Connecting Flights: Post Production; Emergency Landing: Visual Effects; Cabin Pressure: Designing the Aalto E-474; and Easter Eggs. No technical details were announced. The RRP is apparently £19.99. 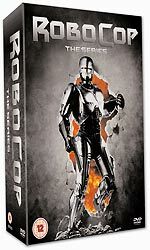 Stax Entertainment will release Robocop - The Series on March the 20th. The six-disc set will contain all twenty-two episodes of the 1994 series, including the 'two-hour' pilot, The Future of Law Enforcement. The series starred Richard Eden. Guest stars include Jon Cypher, Forever Knight's Geraint Wyn Davies, Earth: Final Conflict's Lisa Howard and They Live's 'Rowdy' Roddy Piper. It also features someone amusingly named Dan Duran. The silver-foil embossed set will feature cast profiles, "fun facts and info", "details of Robocop's gun, car and suit plus text features From The Cinema To Small Screen and The Future of Law Enforcement - The History of Robocop". In other words, nothing of any real substance. No technical details were announced. RRP for the set is £39.99. Two acclaimed bio-pics will be released by Warner Home Video during March: Vincente Minnelli's Lust For Life on the 20th, and Clint Eastwood's Bird on the 6th. Lust For Life, the life story of Van Gogh, stars Kirk Douglas and Anthony Quinn (who won an Oscar for his portrayal of Van Gogh's friend, Gaugin). The 1988 movie Bird stars Forest Whitaker as jazz saxophonist Charlie "Bird" Parker. There was no indication that either disc would feature bonus material. The US edition of Bird features an isolated music track and a theatrical trailer. The R1 version of Lust For Life features a trailer and a commentary track (by Dr Drew Casper). No technical details were announced. RRP for both films is £15.99. Bird will be exclusive to HMV. Both discs will apparently be using sleeve art identical to the US editions. 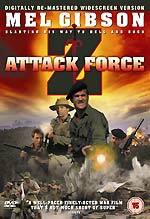 Argent films will release the Mel Gibson movie Attack Force Z on March the 20th. The film, about a squad of Australian commandos in action against the Japanese, in South East Asia, at the tail end of World War II. The film also features Sam Neill and John Philip Law. The disc, which seems similar to one released in Australia by Umbrella Entertainment, will feature a digitally re-mastered widescreen transfer. Bonus features are twenty-five minutes of interviews with the cast and producer, in a featurette titled Attack Force Z: The Z Men Debriefed, a picture gallery, and a theatrical trailer. Here's an interesting fact about the film, courtesy of the press release: "Attack Force Z achieved the highest ratings of any film shown on Sky Cinema in 2002". Make of that what you will! RRP for the disc is £12.99. Twentieth Century Fox Home Entertainment will release American Dad - Season 1 on DVD on April the 24th. The three-disc set will include thirteen episodes of Seth MacFarlane's imaginative animated comedy, which is about a deeply-suspicious and conservative CIA agent, his party-loving wife, their daughter, the alien they rescued from Area 51, and their talking goldfish. The series stars creator Seth MacFarlane, and features cameo appearances by Patrick Stewart, Ron Livingston, Tori Spelling and Carmen Electra. The disc will feature audio commentaries on all the episodes; a behind-the-scenes featurette (15m); deleted scene animatics (15m) and TV spots (8m). The episodes will be presented in Dolby Digital 2.0 audio, with English HoH subtitles. The RRP is £24.99. Sleeve image courtesy of Amazon.co.uk. The fourth season of MacFarlane's Family Guy will also be released on April 24th - more details as they're released. A new Doctor Who audio CD will be released on February the 6th. 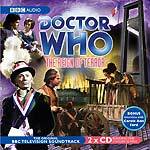 It's a narrated version of the six-part 1964 story The Reign of Terror, which finds The Doctor (William Hartnell) and his companions in Paris in 1794, during the French Revolution. Only four episodes of the story exist as telerecordings. The other two exist only as audio recordings, made by fans of the programme at the time of the original broadcast. Because of this it's not an obvious candidate for DVD release. The two CD set features all six episodes, with new linking narration by Carole Ann Ford (who played the Doctor's Granddaughter, Susan, in the story). A short bonus interview with Ford is also included. There are three - count 'em - new DVD reviews today! Anime enthusiast Andy Davidson has taken a look at Optimum's new Studio Ghibli releases: Miyazaki's charming Porco Rosso and Isao Takahata's Pom Poko (which are due to be released on January the 30th); and Matt West has devoured the latest film in George A. Romero's zombie saga, Universal's Land of the Dead (which is available now). Click on the sleeve images, right, or browse the New DVD Reviews page. We have plenty of goodies for you Firefly fans today! Universal has kindly provided a couple of lengthy interviews with members of the Serenity cast, which you can find here and here. Universal's Serenity review discs have burnt-in spoiler captions, so they're not an accurate representation of the disc that will be sold in stores. This is why you won't see a Serenity review on this site. You can see menu screens for the UK DVD here. The Serenity DVD is released on February the 27th. 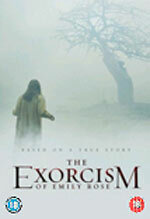 Sony Pictures Home Entertainment will release the American box office hit The Exorcism of Emily Rose on March the 27th. The film, which stars Laura Linney, Eternal Sunshine of the Spotless Mind's Tom Wilkinson and Jennifer Carpenter, is about a young woman possessed by demons. The disc will feature a director's commentary track; deleted scenes; and three featurettes (Genesis of the Story (20m), Casting The Movie (12m) and Virtual Design (20m)). No technical details were announced. RRP for the disc is £19.99. Buena Vista Home Entertainment will release the no-cliché-unturned football drama Goal! on March the 6th. The film, which integrates real superstar footballers like David Beckham and Zinedine Zidane amongst the actors, was largely filmed at Newcastle United's ground, St James Park. It's about a gifted young Mexican lad who's talent-spotted, and brought to play first division soccer in the UK. Bonus features on the disc include Behind the Pitch (a Making of... featurette); The Beautiful Game; a commentary track; the Happy Mondays video for Playground Superstar, Munez +10; Golden Moments of the FIFA World Cup; a sneak-preview of 2006 FIFA World Cup Germany; and a trailer for the next film in the series, Goal II. Oliver Wake has written a terrific article about the lost 1957 Nigel Kneale TV play Mrs Wickens In The Fall, which you can find here.